Worlds largest selection to Attract Bluebirds, Purple Martins, Chickadees, Nuthatches, Finches, Crested Flycatchers, Golden-Fronted Woodpeckers, Red-Headed Woodpeckers, Carolina Wrens, Swallows, Hairy Woodpeckers, and more. 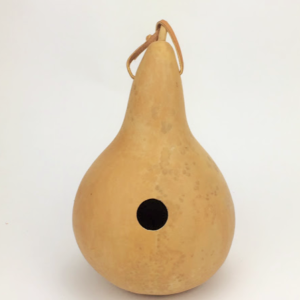 We have the largest year-round inventory of ready-to-ship gourd bird houses anywhere! 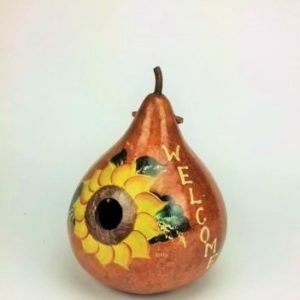 Welcome your friends with this hand painted birdhouse. 8″ dia. gourd with hand painted sunflower. Sealed for outdoor use. Ready to hand with leather strap. Easily clean out and inspect the inside of your bird houses with this Threaded Cleanout Access Cylinder and Screw-On Lid. Nest checks become a breeze! 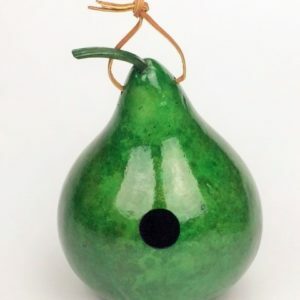 Add to any 8″ or larger gourd. Just use a hole saw to drill a 4-1/2″ hole in the gourd, or cut it out with a jigsaw. May need some slight sanding to fit properly. Use adhesive caulk to secure the snug-fitting cylinder in the gourd. Caulk sold separately. 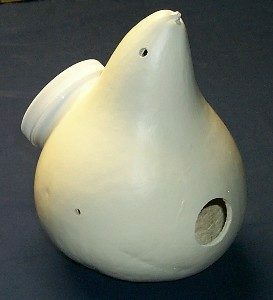 Gourd Birdhouse for bluebirds, carolina wrens, swallows, hairy woodpeckers, and more. About 7″ – 8″ diameter, 12″ tall, 1-1/2″ entrance hole. Clear finish and sealed for outdoor use. Choose a hand painted gourd bird house or make one for yourself! 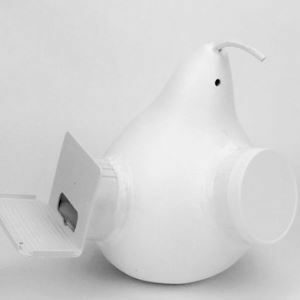 Worlds largest selection of specially-cut birdhouse gourds for specific birds. 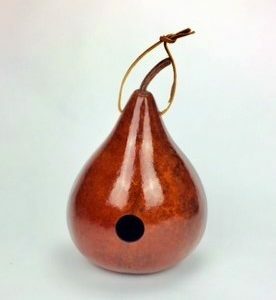 Every gourd loving bird wants an entrance hole that fits. You pick the style you want for the birds you seek. 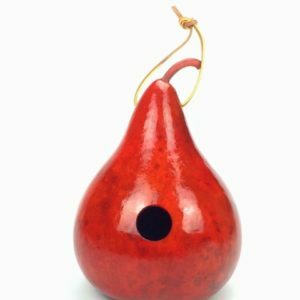 These natural gourd birdhouses invite birds to your backyard, garden, patio, or farm. Wherever you want birds for insect control, living scenery, or just plain enjoyment! 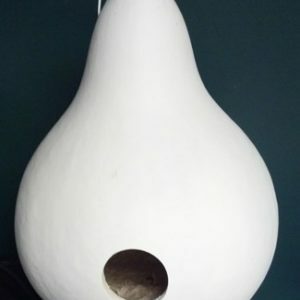 Gourd birdhouses are so popular, I hung this gourd outside to dry after seal coating it and a few hours later a wren was already trying to build a nest inside of it! Funny how they fit the long sticks inside the 1-1/8″ hole. Birds seem to prefer natural gourd bird houses over manufactured housing. When given a choice, and all other things are equal; ie, cavity size, hole size, color, and placement, they will frequently choose natural gourd birdhouses to raise their family. 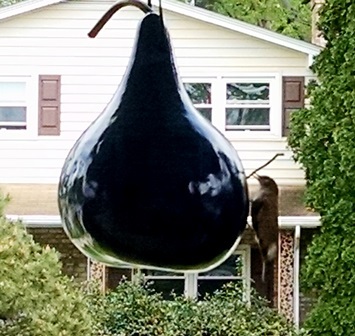 Click on the link above to read this article from The Purple Martin Update to learn why birds prefer gourds. Gourd bird houses come in many sizes to accomodate different types of birds. Birds like an entrance hole that allows them to get inside, but keeps bigger birds and predators out. Our Birdhouse Hole Size Chart helps you attract the birds you want. Choose the right size entrance hole, hang the gourd according to the chart, and soon you’ll be enjoying your new feathered friends. Birds have such great flying skills, they don’t need them. We do not add them to our gourd bird houses, since they encourage predators. Perches allow bigger birds to sit on the perch, reach their head in to the house of a smaller bird, and cause trouble. 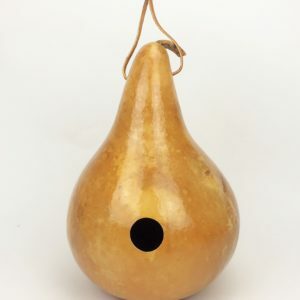 If you would like a gourd bird house for decoration, and want a perch, you can drill a hole a couple inches below the opening and insert a piece of wooden dowel. Except for the Purple Martin Houses, each gourd bird house has 2 coats of Polyurethane to protect it from the elements. (Purple Martin Houses are painted with exterior paint). You may notice after some time outside, they could use some more protection. 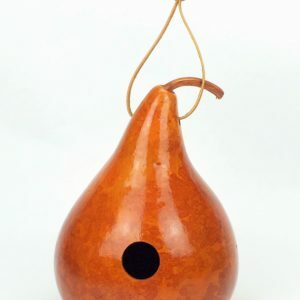 We recommend that each year after the birds have gone, bring the gourd bird house inside, clean it out, wipe it off, sand lightly, and spray on a fresh coat of polyurethane. 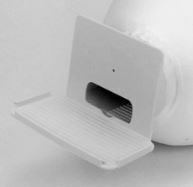 For an easier way of cleaning out the old nest, a cleanout access cylinder and lid can be added to any 8″ or larger gourd bird house. 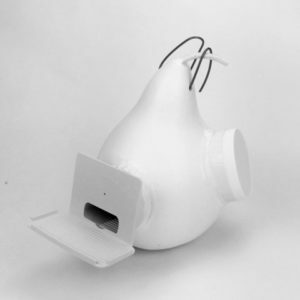 See Purple Martin Houses, Kits and Accessories page. The inside of the gourd bird house will be rough (not completely scraped out). They like to dig their claws into the pith (soft inner part) of the gourd to navigate around their nest. Holes are drilled in the sides and bottom of each gourd bird house for ventilation and drainage. 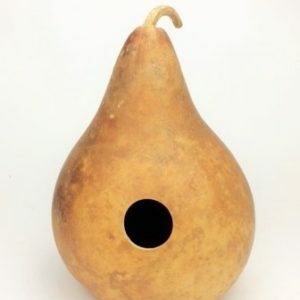 Your birds will be happier in a gourd bird house. To see an actual clip from the Martha Stewart show, demonstrating making a purple martin gourd birdhouse!